Summer is starting to wane into its final moments, which means the signs of fall are already appearing. Pumpkin Spiced Lattes and Halloween candy are for sale, European footy is in full swing, the MLS playoff race is becoming clearer, the transfer window is closed, and Arsenal is still crap; business as usual. 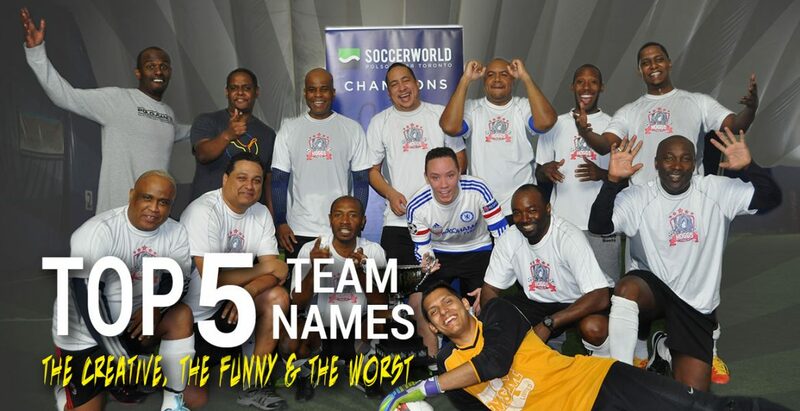 Ahead of the upcoming indoor season the team here at Soccerworld decided to get people in the spirit by having some fun with our Top 5 blog series. The topic this time is team names and ranking them in a superlative format. We have picked 5 categories and will name our top 5 for each category. Names are listed in no particular order. 1) Most Creative: How we came up with this list is simple; anything creative, thoughtful, ‘punny’ and just all around fun team names we’ve seen through the years. 2) Funniest: These names have caused some of us to literally laugh out loud for no reason at all. 3) Worst: I know, I know, everyone’s a critic. We selected these based on the level of effort and the general amount of eye rolls upon reading out these team names. 4) Most Common: For the most common names we consulted the popular search engine google dot com to help us compile the top 5 overused and most painfully underwhelming team names. ABCDE FC, Unreal/Fake Madrid, Hooligans (of everywhere), Multiple Scoregasms, Boca Seniors. 5) Most Obscure: These are the team names left us scratching our heads and wondering if we’re missing out on an inside joke. Alright people, remember it’s all fun and games until your team name ends up on a blog. So, if your team name is up there please don’t take offense. Indoor is coming back so make sure you get registered early to take advantage of the fall promo of free field time for your team, which is still available for a limited time only. If you took the summer off like some of us, join us on Tuesday, Friday or Sunday evenings for a pick-up session. $10 will get you an hour and a half of fun and is a great way to get back into footy form before the season. We look forward to seeing all of you soon when the fall session kicks off. Enjoy what little warmth we’ve got left.